Marley® MX75 is a hanging film type that is installed in a crossflow cooling tower. It achieves cooling by spreading water into a thin film over a large vertical surface thereby exposing the water to the maximum amount of air flow. The degree of cooling that can be achieved by a specific fill depends to a large extent on the size of the fill’s contact surface and the duration of time that the water is exposed to air. 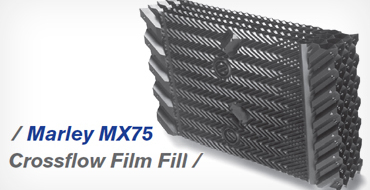 Marley® MX75 fill provides much more water surface exposure per cubic foot than splash type fill. What is unique about its design? MARLEY® MX75’s design uses integrally molded louvers and drift eliminators. The louvers ensure precise air distribution, prevent water from escaping, and guarantees virtually ice-free operation even in extremely cold weather. The drift eliminators typically reduce drift emissions from the tower by a factor of ten or more. Drift eliminators are designed to discharge air directly toward the fan, virtually eliminating drift spotting on adjacent buildings and property. Less drift means you save on your water bills and water treatment chemical expenses. drift eliminators, extra support framing and retainers are not required. Using Marley fill can improve thermal performance by decreasing cold water temperature up to 17%. Only OEM Marley MX75 fill will warrant thermal performance equivalent to original design specifications. OEM Marley MX75 is the only means of maintaining your FM approval and CTU Certification. It is thermoformed from PVC with a flame spread rating less than 25 per ASTM E-84 making it virtually self-extinguishing. Therefore, your risk of fire damage is minimal. MX75 fill won’t rot, is impervious to corrosion and decay, and its wide sheet spacing prevents clogging. MX75 minimizes the drift rate therefore saving water and eliminating the risk of water damage to nearby property. Marley® MX75 should be the only choice when it comes to selecting a suitable fill for a crossflow cooling tower because the superior design of its components provides increased efficiency in cooling capacity.